Yep, that’s me – crazy, paranoid mom. 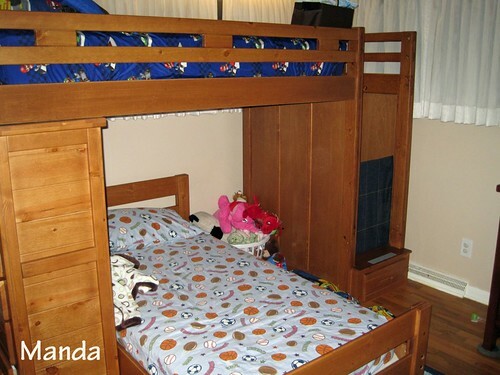 Remember the awesome bunk bed that we bought for the boys’ room? I thought it would be so cool to have steps instead of a ladder. Until Baby E decided that his favorite thing to do was to get there as fast as he could and climb it. He fell down a couple of steps once. It was like in slow motion. I wasn’t that far away yet I couldn’t make it in time to catch him. He was fine, not hurt, but he was really upset about falling. Although he was not upset enough to stop trying it. Baby E was happy in his crib and it fit so nicely below the bunk. We decided to make the transition to “big boy bed” during the summer when hubby and I could take turns putting him back to bed at night. We tried and we failed. Baby E insisted in emptying the dressers but was not interested in sleeping. Plan B was to try the big boy bed at nap time and use the crib at night. It took about a week but he was finally taking a nap in the big boy bed. After a few successful weeks, we started trying the big boy bed at night. Some days were more challenging than others, but he (and we) made it. Finally, the crib is disassembled and stored in the basement. But, what about those stairs? Well, we would move the dresser in front of the stairs to keep Baby E from trying to climb them at night. G slept in the family room (happily, I might add). I’ve been terrified of having those stairs open at night. Nightmares of Baby E falling from the top bunk at 3 AM haunted me. I knew I had to find a solution and fast – it’s back-to-school time and G can’t sleep in the living room forever. So, I came up with a baby gate for the bunk stairs. Something that G could climb over, but Baby E couldn’t. It had to be soft so it didn’t scratch the wood or G when he was climbing. So, now this mama can sleep at night without worrying about Baby E climbing up the bunk steps. I think it looks pretty good in the room too. If you are interested in how I made it, check back for the instructions in tomorrow’s post. 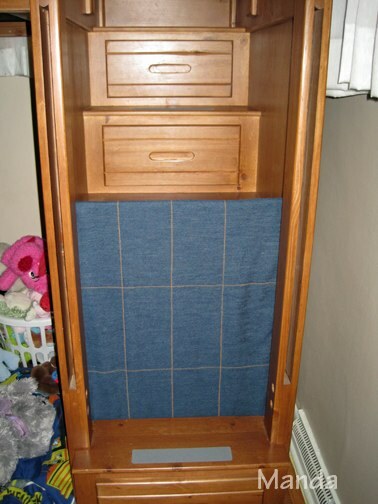 You have a cute bunk bed and that baby gate for the stairs. Great idea! Thanks for sharing this!